The film and media industry is evolving at a rapid pace. Technology has given creative individuals power to create their artistic idea. This course helps the students to understand the base & fundamentals behind this technology. The program has been designed in such a way that students not only learn the specialization but also the common courses which will expand their knowledge in Film Making, VFX & Animation & Photography. This will help them to work in any media industry once they complete their program. 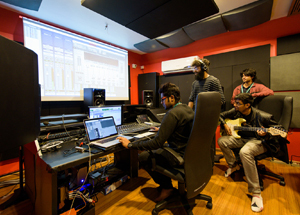 Students get to learn the sound engineering specialization right from the 1st Semester of the program. This program has a practical approach towards Sound Engineering & Music Production where students are expected to actually produce music, record a band, design soundscape for a film, plan acoustics for a studio, etc. Detailed understand of Studio equipments. Software like: Pro Tools, Logic Pro, Ableton & Nuendo. Professional sound studio with Avid S3 control surface, pro-tools HD system monitoring up to 7.1.